In the picture above is one of our chess custom collection. This is the marble chess piece which present in beautiful and unique looks. 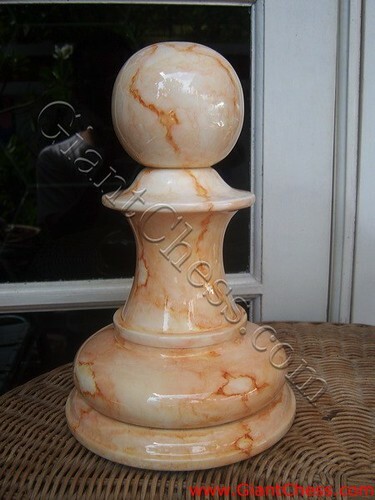 Marble is our choice motive and apply it in our giant chess piece because this motive will match with your house furniture. Not only for house decoration, but you can also use it as a gift for your friend, family or your partner. The other interesting of this chess is its main material. We use best quality Teak wood as its main material in order to make it durable and strong. So it very save for outdoor use and you can left it outdoor for months. This Pawn Chess will also decorate your indoor space as well as your outdoor area. You can put it on library table, children room, coffe table, living room table, and so on. It gives good mood in your house.